Doesn't riding on a sunbeam sound like a fun time? Ms. Frizzle, the teacher character in The Magic School bus series, has a wonderfully wacky way of dressing and an equally unusual way of teaching science to kids. Hop into her magical school bus and you'll never know where you'll end up, but most likely you'll learn something new. In her latest escapade, she takes her class up into Earth's atmosphere where they learn about global warming and ways to combat climate change. 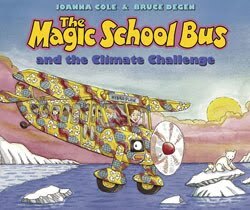 The Magic School Bus and the Climate Challenge covers a lot of material relating to the greenhouse effect and green living. The Magical School Bus series came out a little too late for me to read them as a child so, up until this point, I hadn't read any of the books. I really like the busy, nontraditional layout. In addition to the interesting narrative text, the word balloons, school reports written on notebook pages, and other illustrated diagrams help engage children while imparting scientific facts. It's like reading a fun comic book about science. The Magic School Bus and the Climate Challenge presents information about polar melting, atmospheric gases and fossil fuels. Alternative energy options like windmills, solar power and biofuels are explained. The book also provides suggestions on ways kids can help improve the environment by using less energy, conserving and recycling. Elementary students will find plenty to look at in the book and will hopefully be inspired to make earth friendly changes in their own lives -- a perfect read for Earth Day coming up this next week. Anyone know where I can find a dress like the one Ms. Frizzle wears in the beginning of this book? It's so colorful and shows various ecosystems. I'd love to wear one like it on Earth Day next week along with a pair of those penguin topped shoes. My 5 year old loves these books and cartoon series (it's one of the few he is allowed to watch). The books are often a springboard for a subject he wants to research further. It's nice to see a book motivate him like that. I don't think he has read this particular book. We'll have to look for it for next week. Thanks! My kids have long loved the Magic School Bus books. I've used them many times to help make learning about Science/Health more fun. We have many of these books and the kids have loved how they make science a little easier and more fun to understand. Thanks for posting about this! Magic School Bus has a hallowed place in our house! Thanks for sharing!